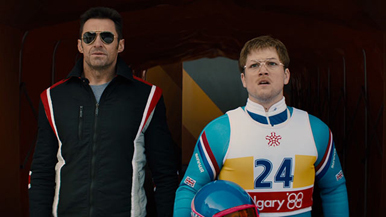 No hallmark of the big-screen sports tale is absent from Eddie the Eagle, the sickly-sweet comedy from director Dexter Fletcher and producer Matthew Vaughn (among others). There’s the sequence where the plucky hero discovers his sport of choice; the bit where the grizzled old veteran refuses to train the plucky hero; and the bit where all seems to be lost, only for a final opportunity to present itself at the last moment. Actually, there are probably a half-dozen sequences in that last vein, as that’s the big takeaway from Eddie the Eagle — if you’re tenacious enough, you can meet reasonable goals. It’s not exactly a life-changing mantra, but you’ve got a couple hours to kill, right? Taron Egerton, practically doing theatrical mask work with a pair of oversized eyeglasses, stars as Eddie Edwards, an Olympic-obsessed British youth. As presented here — the real tale is less cinematic — Edwards was singularly focused on becoming an Olympian, with little regard for what sport took him to the games. When he’s rejected from the British downhill skiing team for being, you know, weird, he decides to take up ski jumping; the English haven’t had an Olympic ski jumper in decades, so all he has to do to make the ’88 Calgary games is learn how to do it.